Many wondered about Apple’s ability to grow continually after the untimely death of Steve Jobs. 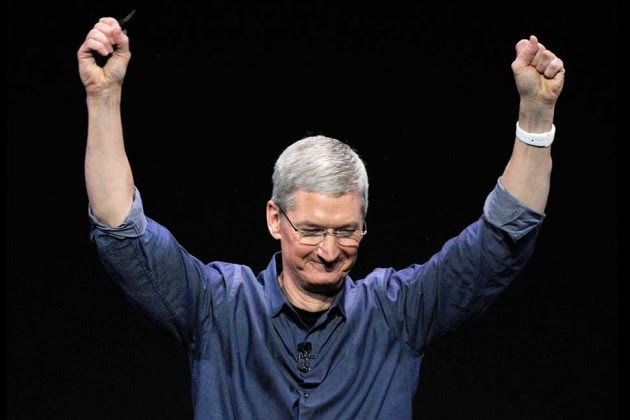 Apple announced a record 4th quarter in both revenue and profitability. The company’s ability to perform consistently comes down to the leadership team that Steve Jobs put into place. I recently watched a commencement speech given by Tim Cook, the CEO of Apple, to the 2015 graduates of George Washington University. Tim did all the right things in his life, in the right order. He obtained an engineering degree and earned an MBA, and in a successful series of events, he had the opportunity to meet with Steve Jobs. Tim was converted by Jobs, the unrelenting idealist, believing that building technology with a passion and a purpose, they could change the world. Cook took the position with Apple, and it changed his life. He learned that by working with people who had both values and acted upon them in their work environments, work became about more than improving his self. Through their work, they have made a significant positive impact to communication, collaboration, innovation, environmental and social conscientiousness, among other endeavours. Some choices are easy; some are hard. Some will make you question everything. The world needs your energy, passion and impatience. Some choices are easy, some are hard. Some will make you question everything. The world needs your energy, passion & impatience. Tune out the cynics and critics. It can be you and it must be you. I was speaking to a friend of mine whose sister died two years ago. Her death has made him question everything. The work he does, the way he spends time with friends, and how his relationship looks like with his family. Consider these words, and allow them to give life to your goals and encourage you to unleash your potential. You only get one life to share with this world – how will you invest your time? For 20 minutes well invested, click here to watch Tim’s speech. P.P.S. We can help identify the best sector, industry, organization, and role, for you, and help you that you are the right fit for. Connect with Brittany Knapp, Manager of Client Services, to start the conversation and learn how we can help you: brittany.knapp@careerjoy.com or 1.877.256.2569 ext 4.